Greater Manchester Chamber is seeking to identify those members delivering carbon reduction services to help direct the work of its newly-formed Carbon Reduction Group. It is asking members to complete a short questionnaire to identify relevant skills and an services of member companies. The information will be used to help increase the levels of business within these organisations by providing a joined up body to address regional needs/initiatives and develop members' expertise and overall market offering. To take part in the questionnaire click here. Your views will help to shape our work and we will also keep you up to date about how the Carbon Reduction Group is being developed. Local firms will be able to find out about the benefits of sustainable building techniques at a seminar being organised by Greater Manchester Chamber’s Building and Development section on March 8. The subject of sustainable construction has risen in prominence over the past few years as businesses look at ways to reduce carbon emissions and improve energy efficiency to lower utility costs. The seminar will cover the key areas of sustainable design, green refurbishment and recycling and will feature speakers from AECOM, Wates Construction and Builders Scrap. Bruntwood will also be speaking from a client’s perspective of sustainable refurbishment. "Banks frequently tell us that lending has been unaffected by the credit crunch and is as buoyant as ever. For the lucky few that might be the case, but sadly that isn’t borne out by what many small businesses are telling us. They are finding it almost impossible to access start-up funding, unless they have a minimum 50% stake. For existing businesses it has not been easy either, with many complaining of increased pricing and fees, even where they have been able to convince the bank to support them. As a not-for-profit, government-backed initiative, Business Finance Solutions (BFS) provides finance for existing and start-up businesses (with a viable business plan), which have been refused funding by the high street banks. Unlike most of the banks, we do not use credit scoring, preferring to assess each application solely on its business merits, the chances of success, growth potential and any jobs likely to be created, so nobody is automatically ruled out. We operate in the boroughs of Manchester, Stockport, Salford, Tameside, Trafford, and across all of Cheshire. Surprisingly, despite the credit crunch and recession there are still businesses who have never heard of us. We continue to spend time trying to improve on our existing positive links with the banks to ensure that where they can’t help, they do at least mention our name as a potential route for customers to access the finance they need. One of our successful applicants is Martin Rooney of Focused Nutrition Ltd in Stockport (recently featured in The Sunday Times). He needed a £50,000 loan for his business, which manufactures a range of Nutrition Products to help promote a Healthy Lifestyle, and after months of searching, he eventually found the money he needed through BFS. Throughout January and February this year, BFS has continued to show strong growth in investments and has made advances of over £200,000 in loan funds so far. We are proud to have exceeded the £4,500,000 mark in advanced loans and have recently passed the 1,350 mark for jobs created and protected in the region. BFS is a provider of Enterprise Finance Guarantee and a fully accredited Small Firms Loan Guarantee lender. 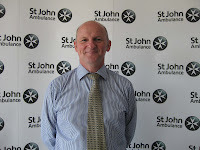 Anyone who is interested in finding out more about BFS and the services and products we offer, should contact us on 0161 245 4977 or e-mail info@business-finance-solutions.org.uk"
Alex Swift, Regional Director for St John Ambulance’s North West Training Division: We are encouraging local businesses to continue making safety a priority in the workplace after recent statistics released by the Health and Safety Executive revealed a positive decline in the number of major injuries across the North West. The figures show that 3,281 serious workplace injuries were recorded in the North West last year compared with 3,387 in 2007/8. The number of people suffering from work-related illnesses also fell from 138,000 to 122,000. We are calling on employers not to get complacent but to make sure precautions for the welfare of their staff remain in place, including doing a full risk assessment, to further reduce the number of workplace accidents. Although the number of injuries has declined, the number of fatalities in the region has remained the same with 22 workers being fatally injured whilst at work. The reduction in workplace injuries is very good news and it shows that having good health and safety procedures in place can really make a difference. However, there are still too many accidents happening at work in the North West and 22 deaths is 22 too many. With the new first aid guidance in effect since October, we’re urging employers to carry out a risk assessment to ensure they are complying with the new requirements. Businesses must have all the necessary precautions in place, such as maintaining floor surfaces to avoid trip hazards or ensuring staff that are doing lifting are trained to do so safely. First aid kits are vital as is having enough fully trained first aiders present at all times. First aid can help prevent further injury and can also mean the difference between life and death, so it’s not something that should be taken lightly or neglected. At St John Ambulance, we can advise businesses on their health and safety needs and requirements, so that workplace injury can be reduced and staff welfare no longer put at risk. St John Ambulance trains 500,000 people in first aid and health and safety each year on courses such as first aid at work, moving and handling and risk assessment. First aid courses are designed to equip workers with the knowledge and confidence to deal with emergencies at work such as treatment of an unconscious casualty, heart attacks, CPR, burns and fractures. Students can also learn to assess risks using the latest training methods and practical mock risk assessments. The economy continues to dominate the local headlines and we want to hear from you about how you think things are going. Our Quarterly Economic Survey helps us to gauge how you, our members, are feeling about business and the economic outlook. It’s totally anonymous and quick to fill out online, so what are you waiting for? Add you voice now. Unemployment has risen across Greater Manchester according to figures released yesterday. The total number of people claiming Jobseekers' Allowance last month was 85,020 compared with 80,745 the month before. Samantha Barker, Policy Manager for Employment, Skills and Workplace Legislation at Greater Manchester Chamber, said: "Today's figures are disappointing for Greater Manchester after three successive months of falling unemployment and rising business confidence prior to December's Pre-Budget Report. "As we anticipated the rise is in part due to seasonal jobs being shed after Christmas as the sales ended earlier this year, however job losses continue due to the ongoing effects of the recession. These figures show the jobs market is still very tough and businesses are uncertain about the strength of the recovery. There is an urgent need for the Government to lay down plans that support wealth and job creating businesses as soon as possible." As businesses, we're constantly taking time to understand our customers but how often do we take time to check our customers understand us. I'm not talking about our brand values or anything deep and meaningful like that. I'm talking about the everyday pieces of information we use to tell customers about everyday matters: instructions to tell customers how to use a product, letters to tell customers what we need them to do, forms to collect their data or terms and conditions about a service – to name a few. These everyday pieces of information, whether we deliver them on paper or on screen, often become the main way of communicating with customers once they’ve signed up. Despite the fact these documents are a vital part of keeping existing customers happy; usually far less attention is paid to creating them than is paid to the more glamorous things like brochures and websites – the traditional methods of enticing new customers. It’s quite easy to see why these sorts of documents usually don't get the attention they need. After all, who’s responsible for them? Marketing are too busy worrying about getting more customers. Customer services are too busy dealing with unhappy customers. After lots of investment in development and testing, a new product is out there in the marketplace and selling well, but slowly it becomes clear that the customers who have believed the hype and bought the new product can’t get it to work, not because it doesn’t work, but because they don’t understand how to make it work. As far as they’re concerned, they’ve followed the instructions properly so they thinks it’s broken or that it doesn’t really do all the great things it said it would. • They ring up to complain and have to be told how to get it to work. So what steps can the company deal with to fix these problems? • Produce new instructions for the next batch of products – not cheap and doesn’t solve the problem for the customers who already have the product. All this because of a piece of misunderstanding that could have been avoided if some time was taken to make sure that customers understood what they were being told in the first place. From the customer’s point of view, if they don’t understand what these pieces of information are telling them, it’s an annoyance to them, and one they’ll be happy to share with anyone who’ll listen. Technology now makes it even easier to tell even more people even quicker than it ever was, and as people are prone to taking recommendations from other people, the potential damage to a brand that unpoliced feedback can cause is massive. Creating information that people can understand isn’t going to bring rafts of new customers beating down the door, but a bit of consideration goes a long way towards gaining some trust and loyalty – never bad things to have from your customers. In fact, with trust in place and a belief in what you're telling them, customers will even be prepared to forgive you if things go a bit wrong once in a while (come on, admit it, they do) – as long as they understand why. Is your business in the Healthcare & Medical Sector? Don't miss the forthcoming mission to Belgium. Over 100 representatives from the adult health and social care sector attended the launch of the Greater Manchester Care Sector Council at the Reebok Stadium in Bolton on Friday, to ensure their views are heard on issues affecting the sector. The attendees were welcomed by the Chair of the Care Sector Council, Salford care home owner, Tony Belvedere, and many were given the opportunity to voice their opinions and pose their questions to keynote speaker, Sue Lightup, Strategic Director for Community, Health and Social Care at Salford City Council. As part of the Greater Manchester Chamber of Commerce, the Care Sector Council is able to lobby on behalf of its members and ensure that their views are heard by the decision makers and key groups and individuals responsible for the strategic development of the sector. For its members, the Care Sector Council will also provide support, advice and influence, and oversee the services provided by the Chamber. “The Care Sector Council welcomes large and small organisations, including residential nursing homes and domiciliary care providers. It will discuss every issue that affects the sector, from image and funding, to training and recruitment. By providing professional policy support, the Care Sector Council will be able to raise the profile of adult social care service providers across Greater Manchester. The Care Sector Council will be of huge benefit to its members, and this in turn will directly impact those in the care of service providers. Greater Manchester Care Sector Council meetings will enable representatives from each area to access and share information and ideas, and decide on strategies to influence future developments within the sector. Friday Guest Blog: Are blogs the beating heart of a social media strategy? Paul Fabretti is Director and Co-Founder of Manchester's first dedicated social media agency Gabba which is also part of leading PR Agency Smith & Smith PR. He has been involved in social media for over 5 years working with some of the region's and country's biggest brands. With brands scrambling to get themselves a presence on social networks everywhere, a pattern is forming. Those that commit time, resources and imagination to communicating on these channels are doing very well indeed. Those that don't, fail miserably. Those that succeed realise that they need to offer something different to the audiences on these channels. Those that fail, simply have presences without purpose - branded outposts with little or no relevant content or contain regurgitated press releases or "viral videos" which are nothing more than cheap tv ads stuck into a social network. But to criticise companies for not being able to commit the appropriate time and resource to making these channels is somewhat unfair. It's not for everyone. The best social media strategies use the right content containing the right messages, delivered at the right time, to the right people on the right channels. But not everybody is capable of understanding how this can be done or geared to delivering it. So what else is there? Blogs. Is Corporate Blogging the Hub of Social Media Marketing? Debbies question is a really pertinent one as we see more and more casual, almost meaningless social gestures creeping into our online world. Friending, poking, liking, rating, status updates and even Twitter with its 140 characters are all quick and simple ways for us to communicate but do any of them add any real value to interactions with customers? Whilst many firms set out with the very best of intentions of engaging customers with their social media strategy, where is the real meat in the conversation. As I often do, ask yourself, how would you interact with someone if they only spoke in 140 characters or sentences with limited meaning, or who simply gave you a thumbs up or down in response to a question you may ask? Out of principle, we in the profession are obliged (and 99% of the time are correct) to say that no social media strategy should proceed without beforehand, monitoring the landscape. That seems to be the proper and sometimes obvious way to get things moving. We then move to discuss the idea that no channel has the right to be used without evidence that there is a need for the brand to communicate in that way to customers. The reality is though (and this is through a lot of experience!) that at the heart of any good social media strategy DOES lie a blog - whether with a corporate hat on or a marketing-led branding/engagement one. The blog, for me, is the way to get to the heart of what social media is all about - people. It is the only way of giving the brand a voice, a means to communicate in a way that the stuffy website or social channels will not let them and a way to to show consumers that the brand really does care. Many have postulated that blogging is dead with the growth of the status update and twitter, but Im utterly unconvinced. What are your thoughts? Can you think of other ways that brands can engage in meaningful conversations with customers yet still make it a quick and easy thing to do? This week’s National Apprenticeship Week organised by the National Apprenticeship Service has seen apprentices, employers, providers and all those involved with Apprenticeship programmes come together to celebrate the value of Apprenticeships. Events are being held up and down the country celebrating the talents and skills of apprentices, and not to be left out we are also hosting awareness events at our centres in Trafford Park and Merchant’s Exchange in central Manchester inviting young people and their parents to come along and find out about the range of courses on offer. We have also chosen National Apprenticeships Week to mark the launch of our recruitment campaign for 2010. Throughout the year we will be arranging a whole host of activities and contacting businesses across Greater Manchester to encourage firms of all shapes and sizes across Greater Manchester to consider the advantages of taking an apprentice on. And unlike Sir Alan Sugar who has to go through a 12-week screening process, our recruitment team are able to do most of the legwork for local firms to ensure they find the perfect match. We’ve been looking at some ways to improve the flexibility of apprenticeships for employers because at the moment, not every business may want to commit over a long period. Some businesses may have specific projects or temporary placements they’d like to recruit for. For that reason the Chamber has set up an Apprenticeship Training Association, to provide local firms with this flexibilty whilst ensuring apprentices have continuous placements at all times. To coincide with National Apprenticeship Week (1 – 5 February), Greater Manchester Chamber is urging school leavers to consider the potential benefits of doing an apprenticeship as a post GCSE or A-Level. Chris Fletcher, Deputy Chief Executive of Greater Manchester Chamber, said: “For far too long young people have been told that the academic route is the only option. The result of this is that we have ended up with a shortage of skilled workers in sectors such as engineering and manufacturing which will be at the forefront of the economic recovery. Apprenticeships have risen in popularity in recent years as the Government has put more emphasis on vocational qualifications to fill the UK’s skills gap. There is a wide range of apprenticeships available in Greater Manchester covering industries such as construction, engineering, hairdressing and IT. National Apprenticeship Week also coincides with the launch of the Chamber’s sister orgnaisation Skills Solutions’ Apprenticeship recruitment campaign aimed to show employers and young people the benefits of apprenticeships. Over the past few years the Chamber’s sister company has helped thousands of apprentices enter the world of work, supported by a variety of employers including high-profile names such as the Bank of New York and Siemens. Also to coincide with the week, the Chamber and Skills Solutions are hosting a series of awareness events at its training facilities across Greater Manchester to allow parents and prospective learners can see first hand the range of courses on offer and speak to staff about the benefits of pursuing apprenticeship training. The first of these events will be held at Skills Solutions SkillCentre at Trafford Park this Wednesday (3 Feb) with additional events across Greater Manchester.